BRANDON, MB – An adjunct professor with Brandon University (BU) has published a comprehensive, first-of-its-kind reference work on a topic of growing concern to individuals and nations alike – the quality of life. Dr. Alex Michalos spent the last five years creating the Encyclopedia of Quality of Life and Well-Being Research, a 12-volume set containing essays from scholars in 58 countries on hundreds of topics including friendship, illiteracy, marginalized communities, yoga, gambling, and 22 of the most popular Quality of Life indexes used by governments and public policy institutes. 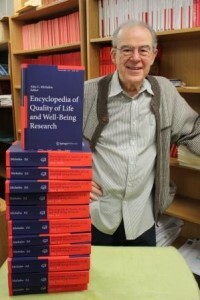 The Encyclopedia of Quality of Life and Well-Being Research is for use by scholars, students, citizens, government and nongovernmental organizations and socially responsible corporations. Dr. Michalos hopes the 75,000 word treatise gives direction to the next 10-20 years of research and informs public debate. Dr. Michalos is Member of the Order of Canada (2010), served as director of research for the Canadian Index of Wellness (2006-2011), and received the highest honour from the Social Sciences and Humanities Research Council of Canada, the Gold Medal for Achievement in Research (2004). Emeritus professor in political science from the University of Northern British Columbia, he has published 26 books and founded or co-founded seven scholarly journals including the Journal of Business Ethics, the most frequently cited journal in the world devoted to business ethics.